Q. Is this made in China? A. No. It was originally born at the Sierra Nevada Brewing Company (AKA: Asian American Brewing Co.) in Chico, California from 1985-1987. It was a joint venture between Cháu Tiên® USA and Sierra Nevada Brewing Co., and it was not a contract/private labeling arrangement as it is often being misled or misunderstood. 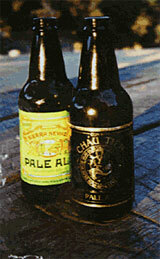 Sierra Nevada sold Cháu Tiên® to its network of distributors and shared a profit with Cháu Tiên® USA. Q. Will this be made in Vietnam? A. We will form a joint venture in Vietnam. "A page of history is worth a volume of logic." - Wendell Holmes Jr.